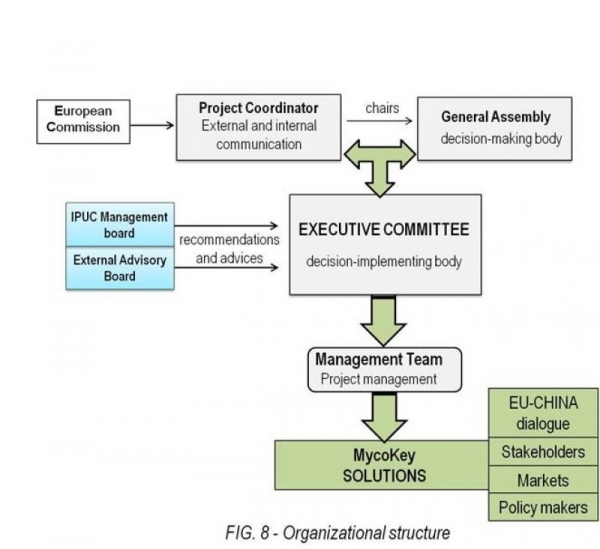 The MycoKey organizational structure is formed by several bodies, which intervene at different stages during the project life and will interact by providing suggestions and decisions to ensure the correct implementation of the project and its goals achievement. The General Assembly is the decision-making body of the project. Chaired by the Coordinator, it is composed of one representative per partner, each having one vote for decision making. The Coordinator of the project is CNR, represented by Dr. Antonio F. Logrieco. The Executive Committee (ExC) is the decision-implementing body, chaired by the Coordinator and composed by WP leaders. The External Advisory Board (EAB) is composed of four EU and international scientists, andexperts of the food and feed chains and will provide advises on the overall goals during the entire project life. The Intellectual Property Use Committee (IPUC) will ensure proper external visibility of the project, and devise a proper exploitation policy and promoting industrial links. Internal and external bodies (i.e. External Advisory Board) work in strict cooperation to ensure the project’s governance, through periodic meetings and by applying monitoring tools.